Fashion has woven the myth that to be chic and to stimulate the senses, a necessary quotient of artifice must be involved. The industry is at a crucial juncture, as can be seen by a visit to any of the fall/winter 2001 runway shows. Founding Canadian industry is intersecting with the highly developed sense of touch; to look good is to feel comfortable. Luxurious and functional by nature, fur is in, reconfiguring for new generation consumers while maintaining the historic values that has proven fur to be a lasting, durable material. Imitating and co-opting nature is the only way that fashions will evolve in synchronicity with the people who wear them. From May 6-9 at Place Bonaventure, over 300 exhibitors plied their wares to 5000 buyers and delegates for Naffem 2001, the 18th edition of the North American Fur and Fashion Exposition of Montreal, the largest convention of its kind in North America. It was a bonanza for demonstrating just how a responsible industry has adapted to changing sensibilities and advanced technologies. Innovations in shearing, dyeing and knitting techniques have made fur a valuable accent, as new treatment methods ensure that classic designs can benefit from trends that previously would have been impractical, if not impossible. Feeling is in, and fur is the lucky research territory. 85,000 Canadians derive important income from the fur trade, including aboriginal communities, the heart and history of Canadian livelihood. Aaju Peter of the Nunavut Inuit Collection sums of the feeling succinctly. The Nunavut Inuit reversible three-quarter-length seal coats (illegal in the United States) introduces the lustrous fur of the North to southern technology with stunning results. The onus of Naffem 2001 was truly on exchange. Established fur designer Zuki brings a splash of colour to the Canadian Fashion Stage. The pinwale sheared beaver and cognac-cobalt lamb reversibles boast playful excursions into sensuality. Rectangular Mondrian quilted full-lengths create three-dimensional grids to drape the body, acquiring form with movement. Chinchilla is at its best in 2001, with provoking winter charcoal gradations. Onyx sheared beaver was a convention highlight with designers producing elaborate cocoon-like wraparounds. Paula Lishman shows just how versatile fur can be. In pioneering the process of manufacturing a fur yarn, Lishman introduced a double-faced knit fur fabric to the fashion world, creating new attitudes towards fur. Her fur jewellery and multi-functional beaver tube shawls were born out of â€œnot wanting to throw scraps away.â€ Paula elaborates. It is this balanced approach that placed her in Chatelaineâ€™s top 100 Canadian Women Entrepreneurs. No overview would be complete without the authority of experience. I asked Syd Sokoloff, 73, the self-proclaimed oldest fur merchant in Canada, how the industry has evolved over the course of his 56-year tenure. This season, there is a wave of designers making fur a welcome component of their creations. Mercy is one such design label causing a stir in trend circles. Jennifer Halchuk and Richard Lyle create a collection of contemporary womenâ€™s separates that integrate various surface techniques such as dip-dyeing and silk-screening. Their reversible squirrel and cream corduroy ensemble with detachable mink accessories is the perfect complement to any urban wardrobe with a flair for tactile luxury. Andy The Anh and Marie Saint-Pierre are also at the forefront of this tasteful integration. These are innovators to be watched closely in the coming seasons. FurWorks Canada is a new concept of sportswear in fur, a project recently launched by the Fur Council of Canada and includes such luminaries as Zuki, Paula Lishman, Bod & Crisan, Hilary Radley, Trinity, and Nadya Toto for Antonio Proietti. 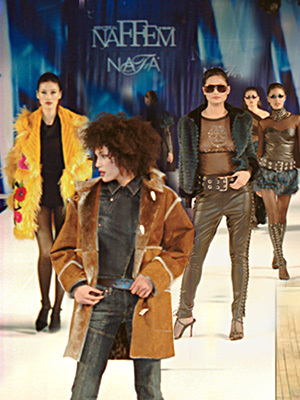 Trendy pieces for everyday wear that use fur as a bold fashion statement were presented at Naffem 2001â€™s closing gala. Every facet of the fur trade was well represented at Naffem 2001. It was refreshing to see trend and designer interest in the event. If fur use is to be this original in the seasons to come, it could easily become a staple of spring/summer collections across Canada and around the world. Imagine a cotton/nylon fibre paper skirt with woven red fox guard-hairs and built-in mink undergarment. Whatever happens, one thing is sure. Canada is a fashion leader and will continue to be a source of innovative design.